You don’t know how much you love something until you lose it! Those of you who follow my blog, probably know that I’ve been dealing with a lot of sudden-onset allergies. You can read about it here. I continue to make progress in reversing the allergies, but I have also found some work-around solutions that let me enjoy many things that I initially had to eliminate from my diet. By trial and error, I’ve discovered that I can eat Parmesan cheese, clarified butter, and butter and cheese made from water buffalo milk in spite of having a dairy allergy, for example. I’ve also found a possible source for camel milk that may or may not work out. I have a local produce stand that has duck eggs briefly in the spring and there is a store in The Pike Place Market in downtown Seattle that sometimes has turkey eggs, but I’ve never been lucky enough to get there when they had any. Quail eggs have turned out to be the best alternative. I seem to tolerate them well and most Asian stores sell them as do some regular groceries that have a section devoted to Asian foods. They taste exactly like chicken eggs. The only thing I don’t do with them is separate the whites from the yolks because that is just too tedious! I took a picture to show you how goose, chicken, and quail eggs compare. Although there is some variation in size, generally, one goose egg equals three large chicken eggs, which equals five to six quail eggs. Duck eggs equal two large chicken eggs. 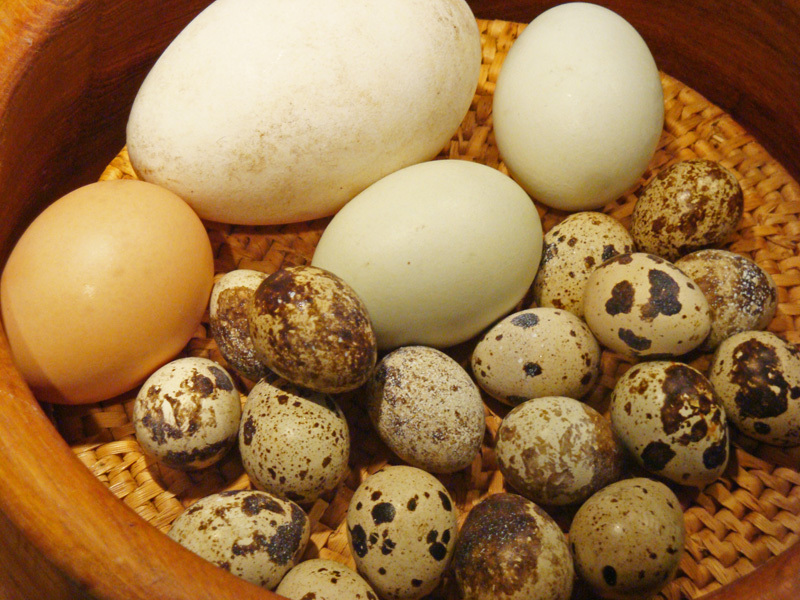 Quail eggs usually come in a carton of ten eggs so it takes a carton to replace two eggs. The price can be over $10 a carton or under $2, depending on where you find them. The ones I buy regularly are shipped in from California. They sell out quickly, so I’ve learned what day they are delivered and buy enough to last until the next delivery. any recipe that is mostly egg-based won’t work. I set out on an an egg quest to see if I could find a bird that was different enough from chickens that I could eat their eggs. I’ve included one of my favorite recipes made with quail eggs. Everyone will like these, even those who are not allergic to other eggs. See the TIPS at the end of this post for how to buy and use quail eggs. Clean fresh, large mushrooms (about 2½ inches across) and remove the stems. Sprinkle them with salt and brush with melted butter. 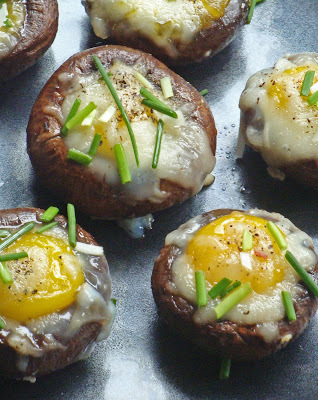 Place the mushrooms, rounded side up, on a rimmed baking sheet and bake in the pre-heated oven for 10 minutes. Remove from the oven and drain on paper towels. Blot the mushrooms with additional paper towels, pressing down into the cap with dry towels to soak up excess moisture. Reduce the oven temperature to 325º F. Arrange the mushroom caps, hollow side up, on the pan and break a quail egg into each one. (See below for TIPS.) Spray the eggs with no-stick spray or drizzle with more melted butter. Bake for about 8 minutes or until the whites are set and opaque. Remove from the oven and sprinkle with grated Swiss cheese or Parmesan. Return to the oven for a few minutes more until the cheese is melted and the yolks are cooked to your taste, creamy or firm. Sprinkle with salt and pepper. Garnish with snipped chives or crumbled crisp bacon or top with Hollandaise Sauce. Serve hot as an appetizer or snack. Quail eggs are very popular in Japan so most Asian stores sell them and many other stores have them on the aisle with the Asian foods. When I started looking for sources for quail eggs, I found stores that sold them for over $10 per carton of 10 and stores that sold them for less than $2. They can also be ordered online, but that is more expensive and the eggs are fragile, so finding them locally is better. The ones I have now say they are from the Golden State Bird Farms in Vista, CA. They don’t seem to have a website, but the address is 676 Osborne St, Vista CA, and the phone number is (760) 941-1492. Quail eggs have tough shells that are difficult to break. 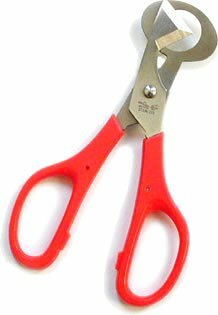 I recommend an inexpensive tool that makes the job easy–quail-egg scissors have a ring that fits over the egg and a sharp pointed blade that cuts the end off so you can tip the egg out without breaking the yolk. Inspect your eggs carefully before you use each one and discard any that are damaged. Sometimes the shells will dent without breaking completely, but they will dry out and mold or spoil and they can contaminate any eggs they touch. Quail Egg Scissors, Quail Eggs, Stuffed Mushrooms. Bookmark. For binding, try unflavored gelatin powder. Thanks for the suggestion, Anonymous! I have used gelatin in some recipes as a replacement for gluten instead of the gums often used.